Ducati Team’s Andrea Dovizioso continued the scintillating pace he showed yesterday at Motegi to smash the existing circuit lap record by four-tenths of a second and claim pole position for tomorrow’s Japanese Grand Prix. In an incredibly competitive Qualifying Practice 2 session where the top ten riders set personal best lap times within half a second of each other, Dovizioso put together the perfect lap to set a time of 1’44.502 to finish 0.055 seconds ahead of Movistar Yamaha MotoGP’s Valentino Rossi, who qualified in second place. Third quickest in qualifying was Repsol Honda’s Dani Pedrosa, the Repsol Honda rider setting a personal best lap time of 1’44.755. Both Rossi and Pedrosa set their quickest lap using the combination of the soft compound rear and medium compound front slicks, while Dovizioso used the extra-soft rear and medium compound front slicks on his way to pole position. Today’s Qualifying Practice 2 was run at a fierce pace with the top eight ranked riders in the session setting personal best lap times under the existing Circuit Best Lap time at Motegi. Warmer conditions were present today at Motegi resulting in higher track temperatures than yesterday, with a peak recording of 40°C in the afternoon Free Practice 4 session. All three rear slick options were utilised today by the riders and although all the compound selections are viable race options, today’s feedback indicates that the extra-soft compound rear slick for the Open-class riders, and the soft compound rear slick for the Ducati, Honda and Yamaha riders will be the most popular race tyres. Front tyre choice for almost the entire grid for tomorrow’s race will be the medium compound front slick due to its good braking character and consistent performance. Slightly cooler temperatures are forecast for tomorrow’s twenty-four lap Japanese Grand Prix which will start at 1400 local time (GMT +9). “I’m happy, even though we didn’t achieve our goal of getting onto the front row, because we have improved ahead of tomorrow. The pace that we have is good. It’s a pity that we didn’t find a perfect lap in qualifying, but we are confident for tomorrowand ready to fight for the win. Our pace is similar to that of Rossi, Pedrosa and Lorenzo and this is important. 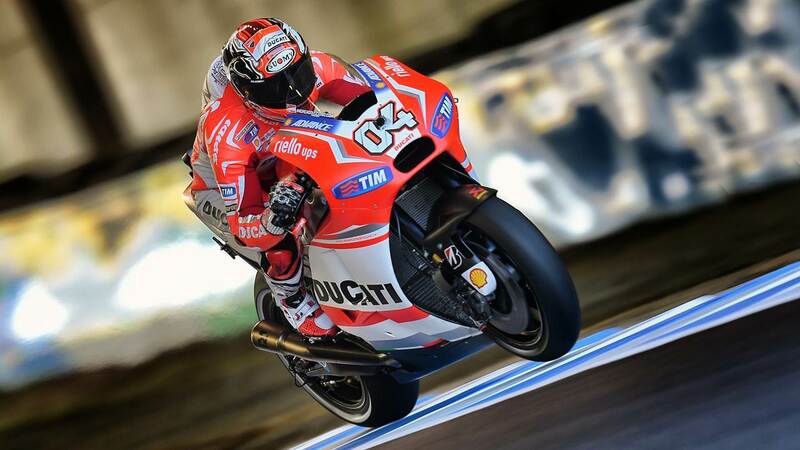 We also shouldn’t overlook Dovizioso, who also has a very good pace on race tyres”. “I’m happy today because we had a good qualifying session and were setting some good times. Unfortunately I crashed on the last lap, almost at the final corner, when I was going quickly to try to get pole position. Luckily I’m fine and tomorrow I will try to use this front row spot to get a good start. It could be a very tight race, because there are many riders who have shown a good pace and this is a circuit that allows for very close lap times. We’ll see what happens but we will strive to do our best and we will remain fully focused. It will be important to ride with skill and bravery”.